In the world of e-commerce, holiday marketing campaigns are in the works as retailers prepare for their Black Friday, Cyber Monday and Boxing Day sales events. In the service industry, however, it may be more difficult to incorporate holiday themes into your marketing efforts. This doesn’t mean your business can’t sprinkle a little joy this holiday season! Whether you’re an e-commerce or service-based business in Calgary, you must make sure it’s personal, appropriate and relevant to your target audience. Small business owners are increasingly integrating video into their marketing arsenal. This develops customer trust, personalize conversations and creates a lasting customer connection. Consider using video to create a holiday campaign around spreading good cheer. Instead of spending all your advertising budget this holiday season, invest a portion in a charitable partnership. You can find a local nonprofit that shares the same values as your company and partner on a “giving” promotion to promote the cause. Achieve does this year-round by donating a portion of every website build to one of our three charities of choice. Some companies volunteer at the local food bank or homeless shelter, not only is this a great team building opportunity, but a way to give back this holiday season. Everyone wants the holidays to be less stressful. Build your campaigns around how you can save people time, save money or make life easier. Think about holiday stressors and how you can help them navigate this time of year. If you have some loyal customers or referral partners, you can say a special thank you at the holidays by taking them out to dinner or hosting a small wine and cheese gathering yourself. Get your services in front of more eyes by showcasing them at special shows or events throughout the holiday season. Market the purchase of your services as gifts this holiday season by offering gift cards or service vouchers for purchase. If you do sell these, you can make them more intriguing option by offering bonuses. For example, you might include a $5 voucher with the purchase of a $20 gift card. If you plan on sending out holiday cards to customers or clients, you can also make those stand out by sending them out early and being the first card, they receive this holiday season. Video marketing is a great way to attract new customers year-round. You can create a holiday-themed video that shows off your holiday spirit with a song or a spoof of some popular holiday stories. Show off your creative side! Your company logo can offer a simple way of showing off your holiday spirit. Simply add some holiday-themed elements or change it to a holiday colour scheme just for the season. You could alternatively add a holiday-themed cover photo or profile image on your social media platform(s). Local search is also very important when it comes to attracting local customers who are looking for specific types of services online. This could be a great time to run a holiday-themed local search advertising campaign on Google Ads. For any marketing campaign, it is a good idea to set up a unique landing page. This can show off any themed promotions and help you measure the effectiveness of those campaigns. The holiday season is upon us, and there is no escaping the madness. While there are only a few weeks left to prepare, it is never too late to capitalize on potential sales. 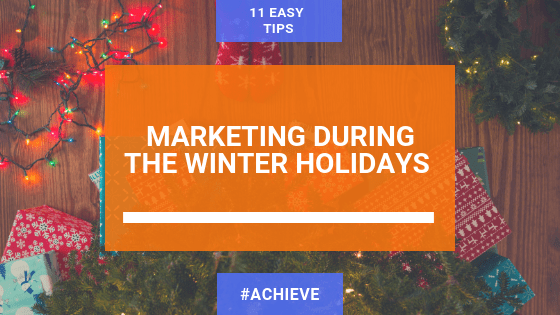 Take advantage of this time and get working on some impactful holiday marketing campaigns today!